Balancing life as a mother and a professional martial artist competing on a global stage is no easy feat, but when you are a Chinese prospect like “Supermom” Miao Jie, you have to make it work. Miao is one of ONE Championship’s top women’s strawweight talents, bolstering its burgeoning roster of world-class female athletes. The 30-year-old native of Shanghai, China holds a win-loss slate of 6-1 and has been heavily regarded as a talented grappler, placing third overall as a purple belt at the 2017 IBJJF World Championships in Long Beach, California, USA. Miao has fully utilized her prowess in the submission department inside the cage as four of her six victories have come by way submission. In her promotional debut under the ONE Championship banner, Miao scored a 49-second submission victory over Mona Samir of Egypt. Following her stellar first appearance in ONE Championship, Miao made another statement as she only needed 45 seconds to submit Australia’s Amira Hafizovic via armbar to set a record for fastest submission by a female competitor in the organization’s history. As she nurtures a professional mixed martial arts career that has seen her reach the global stage, Miao also has to be a full-time mother to her three-year-old son. Although she had to divide her time between being a parent and training as a cage competitor, Miao admitted that it is difficult to juggle two roles at the same time. However, Miao was quick to address that her son is her source of inspiration as she pursues her martial arts career. “He gives me the inspiration that I need to go on in my career and in life. Whether it’s inside or outside the cage, my son gives me the reason to push forward and work for the goals that I want to achieve,” she shared. Miao bared that she allows her son to accompany her at the gym while training for an upcoming bout, which may be an usual outlook on parenting. “I think it’s important for any family unit to have an open line of communication and to be supportive of each other and whatever goals you have,” she stated. Even at the tender age of three, Miao’s son fully understands more about the physicality of the sport that her mother struts her wares into. Asked whether she would encourage her child to follow in her footsteps, Miao explained that it would depend on her son’s own level of passion. “I don’t want to force him. I want him to follow his own dreams. If he does want to get into it seriously, then we’ll have a serious discussion about doing the sport because if you’re not serious, that’s when you can get hurt,” she acknowledged. According to Miao, having a child changed her own attitude in life as she had to pick up a regular job on the side while building her professional career. “Once you become a mother, a parent, your priorities change and you’re in charge of a human being for the rest of your life. It is my responsibility to raise the best human being that I can, and part of that is becoming a good example and being able to provide for him,” she disclosed. Looking to fully cement her position as an up-and-coming martial arts superstar in Asia’s premier martial arts organization, Miao seeks to showcase her complete skills once again as she makes her third appearance inside the ONE Championship cage against Iryna “Delsa” Kyselova of Ukraine in a three-round strawweight encounter. Both ladies are set to collide on the undercard of ONE: KINGS OF COURAGE, which takes place at the Jakarta Convention Center in Indonesia on 20 January. “It’s my third bout in ONE Championship. I feel fortunate that I can showcase my talent in front of a worldwide audience through a platform like ONE Championship. I am here to win again and keep my momentum going,” Miao said. 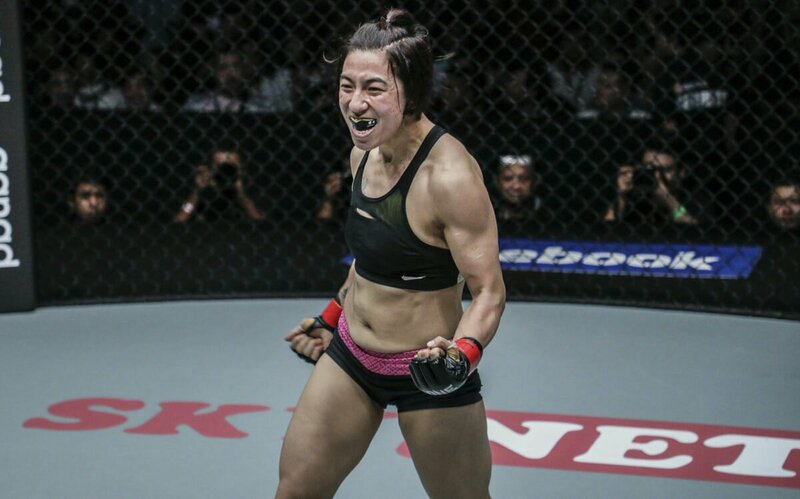 Miao pointed out that her third outing as a ONE Championship athlete should serve as a springboard for women and mother like her to understand they can truly do anything if they put their minds and hearts into it. “I would like to continue this campaign for everyone who doesn’t understand the beauty of this sport. Martial arts is not about fighting. Its real aim is to empower both men and women. We’ve already seen what women can do inside the cage. It’s a high time to unleash our full potential in this sport,” she ended.